This Friday and Saturday! Join in the fun! 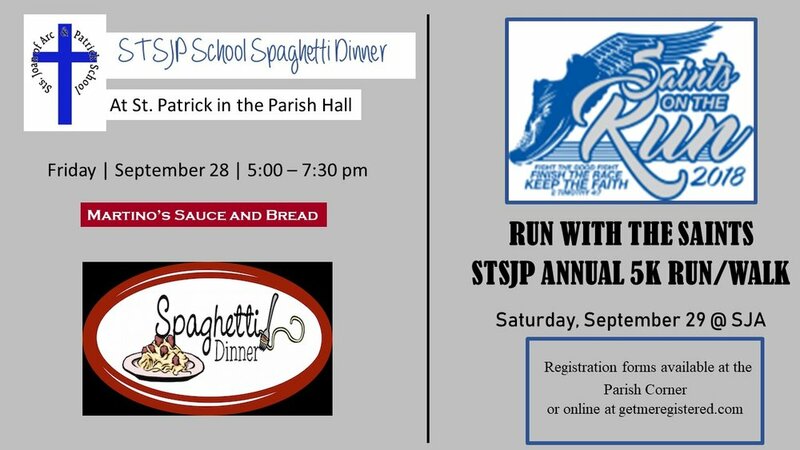 Spaghetti Dinner at St. Patrick in their Parish Hall (lower level) from 5:00 - 7:30. You can pick up your 5K packet and if you haven’t yet registered you can do so at the dinner. Run with the Saints Saturday - Registrations are accepted if you haven’t yet done so. Pick up packets beginning at 7:45 am. Fun Run is at 8:40 am and 5K Race begins at 9:00 am.